This family-friendly winter showcase is intended to reflect a posada, a nine-day festive anticipation of Christmas in Mexican culture. 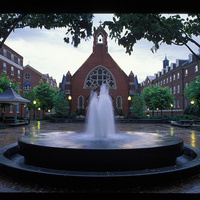 Beginning with caroling in front of Dahlgren Chapel (representing Mary and Joseph’s search for shelter in Bethlehem), the event then moves to additional locations on campus to recreate their journey, ultimately landing at Gaston Hall for a diverse program featuring traditional dances from four Mexican states. A reception follows with authentic foods. Lyrics in Spanish with English translations will be distributed.